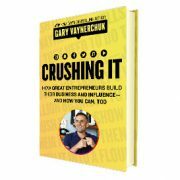 Gary Vaynerchuk, @GaryVee, the 4-time New York Times bestselling author, famous for advising everyone to Crush It! and now to keep Crushing It! The guy who took over his family wine business and increased its value twenty fold, before starting his own digital marketing company. The CEO of a hundred million dollar business, who still takes a moment to shake hands with fans on the street and offer some free advice whenever he can, and vlogs about it on Youtube. That guy. He wrote a book.